Annual trail maintenance projects funded in part by VAST include construction of new bridges, installation of culverts, and cutting/rerouting trails. Ongoing projects include bridge repair, brushing, gate maintenance, and fixing wind and water damage. 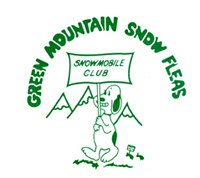 The Snowfleas are always looking for volunteers to help with trail. 2018 Chester's Valentine's Ride In. Thank you Fred Burkhardt, Teri and Rich Conte, Karen and Joe Marini, Deb and Joe Nardini, Dan Tiernan, and Vanessa and Mike Zampini for supporting a neighboring club! 2018 Weatherfield Pathfinders' Poker Run. Thank you Fred and Cam Burkhardt, Dave Berry, Joe Marini, Jeff Stearns, Crystal and Clay Sides, Dan Tiernan, Jean and Russ Walsh, and Vanessa and Mike Zampini for supporting a neighboring club! Our Annual Pig Roast and Landowner Thank You. Mother Nature didn't cooperate but we had a good turnout despite the rain. Photos courtesy of our favorite photographer, Patty Madigan Companik. Touch-A-Tucker was special thanks to Jim and Laura Kelly! Jim was this year's photographer who brought his portable printer and gave everyone a souvenir photo. Laura was Jim's assistant when she wasn't selling clothes and giving out stickers. This event wouldn't be possible without the generosity of Jeff Stearns, who each year provides the equipment to transport the groomer. Thank you Jeff! On Feb. 11, 2017 The Club did the Chester Valentine's Day Bonfire. Also on Feb 19th the Snow Fleas took part in the Chester Poker Run. On October 8th Over 130 people enjoyed the cooking of chef Ned Bowen at our Pig Roast. And a successful Silent Auction and 50/50 raffle increased our Building Fund by over $2,800. We were very pleased that 15 Cavendish landowners accepted our invitation for a complimentary meal allowing us to acknowledge and thank them for letting us have trails on their property. Checking out our Tucker was a popular spot during the Proctorsville's Annual Town Wide Tag Sale on July 30th. We think we've lined up a group of future groomer operators ... we just have to wait a few years! Thank you to our photographer, Patty Madigan Companik, and to all who stopped by! Cheeseburger event April 28th at the Cook shack. A special thanks to the folks from the Chester Snowmobile Club, the Ludlow Cronchers, and the Weathersfield Pathfinders who came out to support us. Ludlow Side Hill Cronchers and the Snow Fleas enjoy lunch at the Chophouse. Mother Nature ruined our plans for a Club ride so ... we had a Club drive! And some of our friends from the Chester and Andover Clubs joined us. Over 100 people enjoyed our first annual Pig Roast! Share your 2014/15 riding pictures with us. Share your 2010 riding pictures with us. The Cavendish Snowfleas Snowmobile Club takes great pride in the maintenance and conditions of its trails. Our groomer may be on the trails at any hour so please be alert. The speed limit is 35 MPH unless posted otherwise so ride cautiously and stay to the right since there are many families with young children riding our trails. Please respect the property of the landowners who allow us to ride by staying on the trails and keeping the trails free of debris. A Christmas party was held at the home of Leon "Woodie" and Gail Woods on Thursday, December 10. The Christmas party coincided with Woodie's birthday. The club surprised Woodie with a birthday cake. A good time was had by all. The Cavendish Snowfleas Snowmobile Club maintains a Food Shack that is located on Twenty Mile Stream Road. On the VAST trail system it is located at the intersection of snowmobile routes 126C and corridor route 12 N/S (WR 43). The Food Shack which is operated by volunteers is open on weekends from 11:00 AM to 3:00 PM weather permitting. A variety of food and drinks as well as trail maps are available at reasonable cost. Oh yes! Adjacent to the Food Shack is a Porta Pottie. Share your riding picutes with us.